The water we drink is groundwater and comes from an aquifer deep underground. This is true whether you have a private well or public water (sometimes called “City or Town Water”). According to the United States Geological Survey (USGS), groundwater is the sole source of fresh water for 2.6 million people on Long Island. The water you drink depends on a healthy aquifer. The health of Georgica Pond is also intimately tied to the aquifer as the majority of the fresh water entering the pond comes from groundwater. The aquifer is like a giant underground sponge soaking up molecules of water. Rainwater and snow melt percolate through the spaces between soil particles, eventually reaching the aquifer. Wells are drilled into the aquifer and pump the fresh water out as needed. This system works well as long as the amount of fresh clean water recharging the aquifer equals or exceeds the amount that is pumped out. If pumping exceeds recharge, the aquifer can be “drawn down”. If contaminants such as PFCs (perflorinated compounds) reach the aquifer; it can become contaminated. The first contaminant detected in Long Island’s aquifer was Temik a pesticide widely used in potato farming. The EPA banned Temik on Long Island in 1980 and finally, phased it out throughout the United States in 2010. Since Temik was discovered in groundwater, a series of other contaminants have been found. Nitrogen, an essential nutrient, is a contaminant when nitrogen-rich wastewater merges with the aquifer. Even saltwater is a contaminant. Saltwater intrusion occurs near the coast when the freshwater aquifer is drawn down allowing saltwater to invade the aquifer. Recently, the Suffolk County Water Authority (SCWA), the largest public water supplier on Long Island, in cooperation with the Town of East Hampton and New York State, installed 8.5 miles of public water mains in Wainscott to provide public water to homes whose private wells had been contaminated by PFCs. According to the SCWA, this is one of the most ambitious infrastructure projects in their history. SCWA is also building a new well on Stephen Hands Path in Wainscott to help meet this new demand. Why would public water be any better than private wells if they are both pumping from the same aquifer? 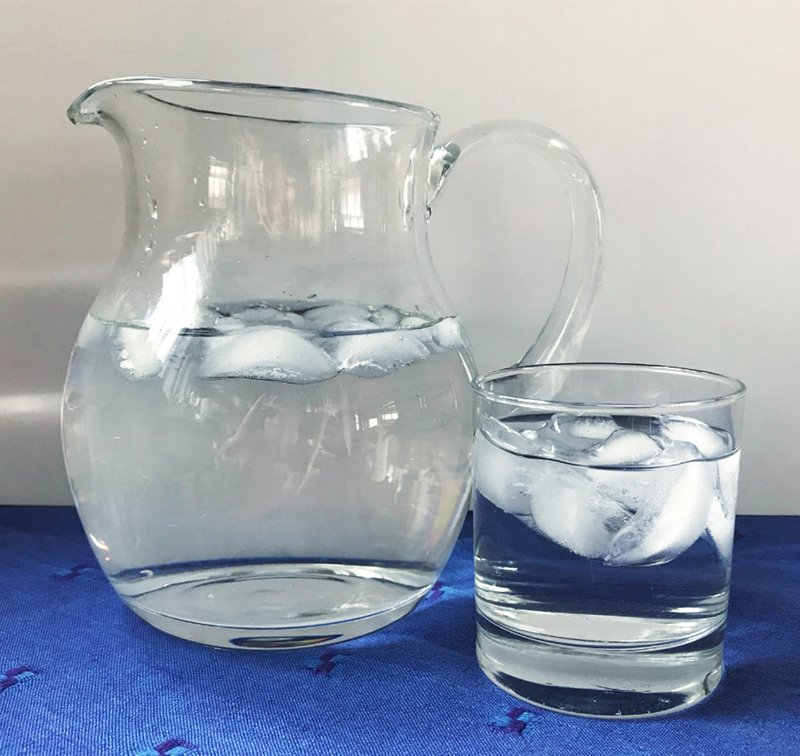 The advantage of having public water over private wells in a situation like Wainscott is that the Suffolk County Water Authority continually monitors its wells and can treat or close a well if contamination is detected. Also, its wells are generally deeper than private wells and can often avoid areas of contamination closer to the surface. 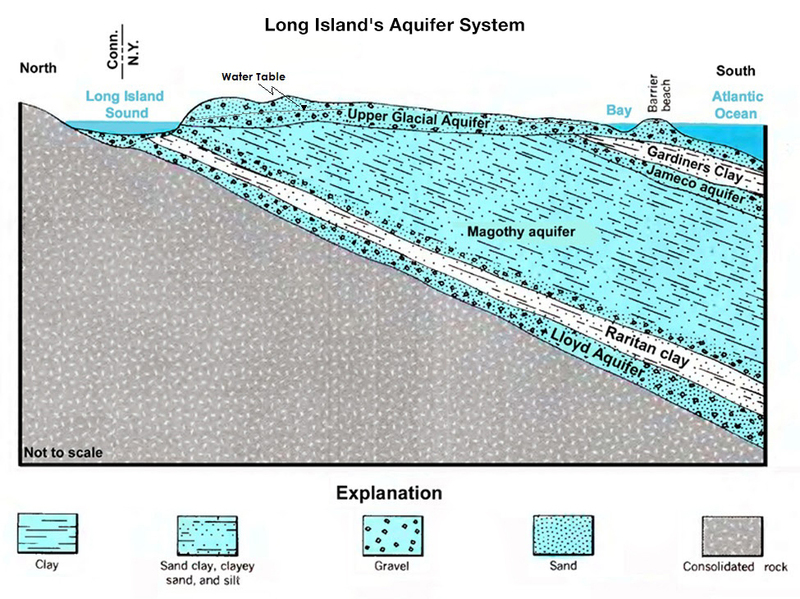 On the diagram below, you can see that the aquifer is actually several distinct layers. Most private wells are pumping from the Upper Glacial aquifer, while many public wells pump from the deeper and older Magothy aquifer. As a resident of Suffolk County, you can make a real difference to the quality and quantity of water in the aquifer. The first rule is to conserve fresh water. Fix all leaks immediately. Reduce the amount of landscape you irrigate (watch for helpful irrigating tips in a future newsletter). The second rule is to stop contaminating the aquifer. Don’t use synthetic chemicals like fertilizers and pesticides in your landscape. Convert to organic slow release fertilizers. Don’t use strong chemicals such as bleach in your home. Don’t flush chemicals or pharmaceuticals down your drain.